Only very basic thoughts here: did you replace the cylinder for this reason? I would not think air would cause loud noise, expect something is binding based upon what you are saying. Sure the hoses are connected to correct ports? Have you by chance tried jacking the front end clear and trying to see if you can find any binding or if the steering no longer makes any noise? I am no hyd expert but if making noise think it may be a relief valve more so than a cylinder. Last thought, how is the fluid level for the steering? I got it to stop by heating nuckel with a propane torch and completing turn cycle. Thinking bearing. Used 10 hrs and parked it. Went back to work (bush hogging) right back where I started. Fluids good. Hoses are right because I had to switch them when cylinder installed. Now feel like it is not bearing because it stopped. It has been suggested that the spinal may be dry. So I am going to get the torch out again and force grease through it. Cleaned it all up today. No air in lines. Do not know where relief valve is. I have a manual. I guess 10 hrs would dry the spinal again. But full of grease and both sides are the same. By myself so hard to tell. It sounds like it is a bearing flat spotted. Metal on metal. But both at once has me questioning that. I had to replace the cylinder after I blew the seals out getting it home. Was fighting the steering and thought that was my problem. Any decent hydraulics shop can overhaul the steering cylinder, I think back a year or so ago, my 2360 had to have new seals and a couple of o-rings and that was about it. Also, you won't get squealing from the wheel bearings unless they are rolling. I think,if I read your post correctly you only get the squeal when trying to turn the steering wheel. If that is when you hear the the noise, you might want to check the steering belt, belt pulleys and see if the pump pulley is turning freely. Also, make sure those zerk fittings are lubed good on the linkage. They are right in front of the engine, way down low in the middle area. 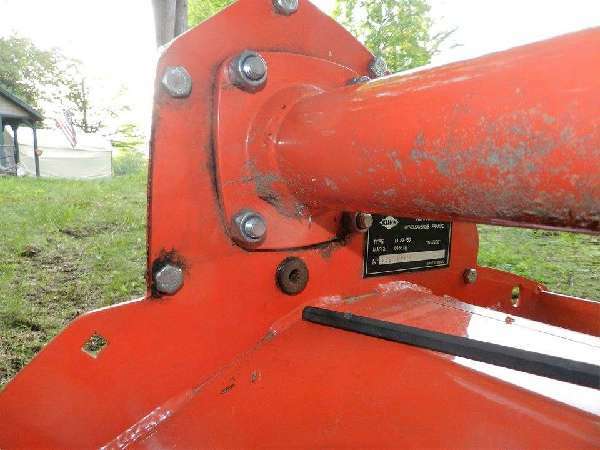 If you blew the seals out of the hydraulic when trying to turn the wheel, it has to be the linkage and/or the pitman type arm under neath there in the middle down low where the zerk fittings are located. If your tractor has to sit out in the weather, like mine, that linkage will bind real quick if you don't keep it lubed good. These are good old tractors and the height of simplicity to maintain. I heated it up again and pushed another tube of grease in her. Quieted down. I have not checked the belt. Thank you Yea this is a great tractor. Strong motor Loader. Everything.